Continued from Teenage Mutant Ninja Turtles #12. 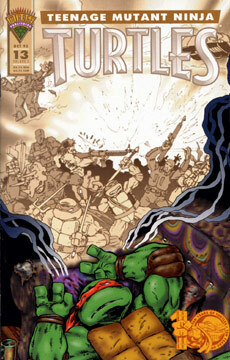 The soldiers open fire and Leonardo falls from his perch near the opening – fortunately, Raph catches him. As the guys try to figure what to do, they hear a loud explosion from the surface, and when they peek out they see that the Triceratons have begun their attack on the base. A true maelstrom of violence ensues as the agents of D.A.R.P.A. battles the invading Triceraton forces. The fight doesn’t go well for the Triceratons, but the commander aboard the mothership won’t recall his troops. Instead, he plans to crash the crippled craft into the surface of the Earth at Warp 8, to inflict as much damage upon the planet as possible and die with what his people consider honor. As the Turtles and their remaining allies prepare to flee, Braunze warns the others that their Triceraton companion is a traitor. The beast fires a blast from its gun that leaves a huge gaping hole in the man’s chest. As Braunze lays dying, he informs Leonardo of the Triceraton commander’s suicide plan. This news enrages their former Triceraton ally, who refuses to believe that his commander would resort to such a tactic, and declares that the reptilian aliens will soon rule the Earth. As the Triceraton warrior makes his speech, a jet engine falls from the sky and explodes onto him. Braunze’s alien friend has the Turtles help him right a Jeep that had been turned over. The fellow plans to go back inside the D.A.R.P.A. base to attempt to thwart the Triceratons from crashing their ship into the Earth. Leonardo attempts to go with his alien compatriot, but a blast of air from the visitor’s shoulder apparatus sends Leo flying. The alien tells Leonardo to get his friends to safety as he drives off. The TMNT and Casey retreat to the desert. As the alien drives the jeep, we see that Braunze is seated beside him – the man used his mental powers on the Turtles to fake his death. Braunze and his friend plan to use an “inter-phase cannon” located on the base to move the Triceraton mothership out of phase, causing it to pass through the Earth’s crust and resolidify once it reaches the core – vaporizing the threat. Leonardo wakes up from a dream with a start on the couch in Casey and April’s apartment. Casey is cleaning up the place and Shadow is playing a Godzilla video game. Casey asks Leo if he’s okay, and the Turtle asks Jones how they survived the blast and when they got back home. “Nevada, you idiot!” retorts the bemused Turtle. Leo sits puzzled on the couch for a time, watching Shadow play her game. The girl notices Leo’s distress and comes over to him, and he picks her up. Leo goes to the window and looks out. On the street below stands Mr. Braunze. “GOODBYE, LEO” bids the telepath, and then he walks off into the crowded New York City sidewalk.